Could you please give a link to the fed taper schedule? Thanks a lot! Edited by dTraderB, 31 October 2018 - 05:56 AM. After yesterday's strong rally, we're already back above all our -10% lines except the Russell, which actually fell from 1,750 to 1,450, which was 20% so bounces from a 300-point drop are 60 points so 1,510 (where we are now) is weak and 1,570 is strong so really, on the Russell, that 1,575 line – is the more important number to clear which means, logically, if you are going to back a bullish horse, /RTY may be the way to go. Meanwhile, before we go reaching for the stars, we should at least see if the S&P can get over it's weak bounce line at 2,710 and the NYSE 12,150 (they are bopth around there this morning) and whether they turn black or red this morning will likely determine the direction of the market. As noted in the title, however, it's the last day of the month and all the stops will be pulled out by the powers that be (the Banksters, not the Government) to engineer a not-so-terrible finish to the month. As I noted yesterday, China, Europe and the US have all taken measures to boost the markets so of course we're hitting our weak bounce lines and the strong bounce lines won't be surprising but will we hold those? Sadly, that's a question we'll have to answer in November but, for today, expect more of the same from yesterday and a HUGE disappointment if we don't. I prefer to accumulate today and rest of week.... but try to give enough room for a few 30 plus NQ trades. Playing it safe and not risking profits. There is a good chance that weeks from now we will look back at this Tuesday as a key turning point in S&P 500. It was only the second time the index finished in the green in the last ten sessions, but that’s not the only thing that made it feel different. Volume has been ramping up over the previous six sessions and Tuesday’s rebound was the highest of them all. Clearly, something big is happening, the only question is what. If there is one thing both bulls and bears can agree on, it is that markets don’t move in straight lines. It has been a brutal October for stocks. At the very least, a near-term bounce is overdue. After definitively undercutting the early October lows and setting off a tidal wave of panicked defensive selling, this is about as good of a double-bottom setup as we will ever see. While nothing in the market is ever certain, double bottoms are some of the most resilient bottoming signals the market gives us. Prices undercut the prior lows, triggering an avalanche of reactionary selling. But rather than trigger the next leg lower, that dip is the last gasp of defensive selling. Once we run out of emotional sellers, supply dries up and prices rebound. Monday’s frighteningly horrific collapse was as bad as it gets. We opened green, but it was downhill from there and by early afternoon, the index shed more than 100-points. But what if that really was “as bad as it gets”? Maybe, just maybe, that was the worst and everything will get better from here. As the saying goes, it is darkest just before the dawn. As I already stated, both bulls and bears can agree a bounce is coming. And most bears will even concede that the biggest bounces come in bear markets. This means that no matter which side of the bear/bull debate you stand on, there is an excellent chance this market is ripe for a sharp move higher. 2,700 is the next most obvious price target. But the market likes symmetry and a rebound to 2,700 doesn’t even come close to matching the intensity of October’s selloff. 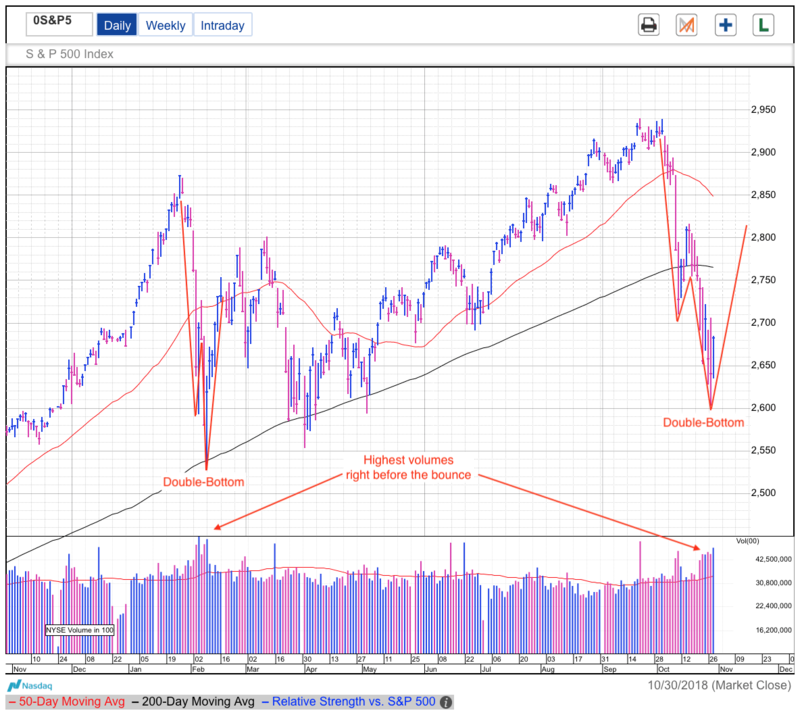 While we could pause and even retrench a little at 2,700 over the next few days, the most likely target for this rebound is the 200dma/2,800/2,820 region the previous bounce stalled at in mid-October. Even rising up to and above the 50dma and the start of this selloff near 2,870 is on the table. But just like how selloffs don’t go in straights lines, neither do recoveries. After recovering 200-points from the selloff’s lows, it will be time for another dip. How big of a dip depends on which side of the bear/bull debate you fall on, but at least both sides can agree that a bounce and a dip are still ahead of us. We can argue about the magnitude after we get there. If a person wants a preview of what this looks like, scroll your favorite charting software a little to the left and see what took place this spring. A big crash in February, a sharp rebound from the lows, and a pullback from the rebound’s highs. Predicting the market isn’t hard. That’s because it keeps doing the same thing over and over again. The challenge is getting the timing right. There are no guarantees in the market and the best we can do trade when the odds are stacked in our favor. This selloff is ripe for a bounce and right now that is the high probability trade. If it doesn’t work out this time, we retrench and try again. I guess the big question will be, will the rally be straight up or volatile.... The moves this year remind me a little of 1997. Anyhow If all the concerns about tariffs, slowing economy next year are ignored, why did the market fall then.....If we see volatility going higher we'll be able to say its not a manipulated market. This is important! BUY as much as you can get if the FED even hint, even the remotest possibility, they will change course!